qualified B.E/ B.Tech or Diploma in Civil or Electrical or Mechanical Engineering they can apply online for this Chhattisgarh Professional Examination Board Recruitment 2018. For CG VYAPAM PWD Sub Engineer Recruitment 2018 candidates who are having diploma or graduation Engineering/Technology they are eligible. 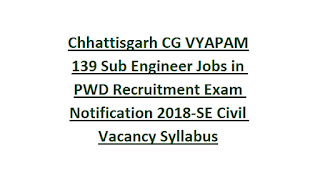 Total 139 vacancies are in this CG VYAPAM PWD Sub Engineer Civil Recruitment 2018. CG VYAPAM is recruiting this SE Civil jobs to fill the available vacancies in PWD of Chhattisgarh State. Selection for CG VYAPAM PWD Sub Engineer Vacancy Recruitment will be through Written Test only. Closing date for online application form submission for this CG VYAPAM PWD Sub Engineer Civil Jobs is 13-01-2019. 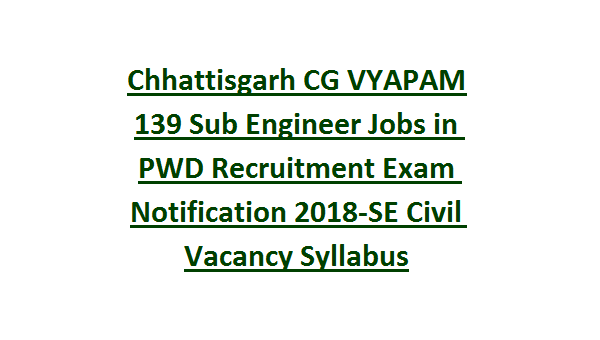 For more details regarding Chhattisgarh PEB PWD Sub Engineers Jobs vacancies, exam pattern and syllabus, online application procedure, selection process, salary, application fee and more details are given below. Vacancy Notification for CG VYAPAM Sub Engineer Jobs in PWD . There are total 139 Sub Engineer vacancies available in this Chhattisgarh PWD . For Sub Engineer Posts: 21-35 years as on 01-01-2018. For PWD Sub Engineer Jobs-Diploma or Degree in Civil/Electrical/Mechanical Engineering. Pay Scale is applicable as per PWD cadre posts. The selection for CG VYAPAM Sub Engineer and Jobs is through objective type written exam which will be conducted for 150 marks. CG VYAPAM PWD posts online application last date is 13-01-2019. Submit application form online through CG VYAPAM official website of @www.cgvyapam.choice.gov.in.